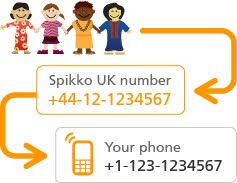 Go to Spikko Facebook fan page ans select you contry. Now, Click on “Click here to get a number” and fill up the form with all the necessary details like phone number you wish to receive calls. make sure uk contry code is +44 and which ever no. you get you can either add +44 or 00 to your no. Make sure This will cost you original U.K call prize.